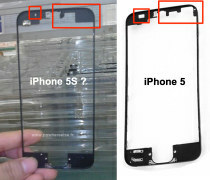 Parts and pieces of the Apple iPhone 5S have been leaking quite a lot recently. 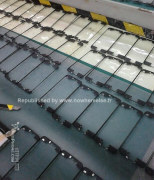 The latest allegedly comes from an assembly line of a Foxconn subcontractor that makes the front panel of the next iPhone. 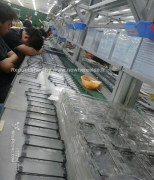 The photos might not be genuine with the workers on the line sleeping on the job and not wearing masks. Still, if they are the real deal, then they show a different arrangement for the sensors around the earpiece. From what we’ve seen from previous leaks, the front-facing camera on the iPhone 5S will be in the same position, but will use a different ribbon cable. The hole for the screen seems to be exactly the same, which goes against all the rumors that the next iPhone will have a larger display. Unfortunately this black panel tells us nothing about the potential third color option or a lower-end iPhone model. Analysts think a low-cost iPhone might launch before the proper iPhone 5S and the WWDC, which starts tomorrow might be where it debuts. The event is sure to bring the next iOS version, but we’re doubtful we’ll see a new iPhone. Lmao. A round of applause for this troll. Hiding behind games and childish responses. If you believe all the comments on this site, I have a bridge to sell you. From a Galaxy S6 user.